Combine hoisin sauce, pomegranate juice, sugar, and orange peel in small bowl; set aside. Combine coleslaw, edamame, carrots, cilantro, and jalapeño in medium bowl. Add chicken and peanuts; toss gently. Arrange lettuce leaves on large plate. 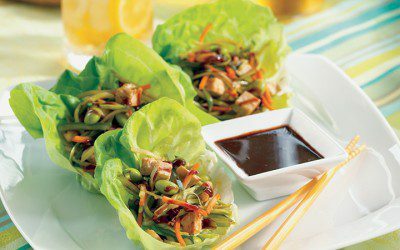 Spoon about 1/3 cup mixture on top of each lettuce leaf and drizzle with 1 teaspoon sauce. Exchanges per serving: 1 Bread/Starch, 1 Fat, 1 Meat.